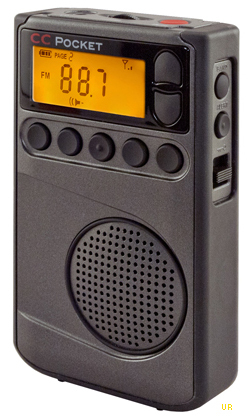 The C Crane CC Pocket Radio puts great radio fidelity, plus weather information in your shirt pocket. It stands upright for convenience and best audio through the speaker. The sides are rubber coated to protect the radio and provide a firm grip. There is an FM antenna built-in so you do not have to connect a wire or headphones to achieve good reception. The Stereo/Mono/Speaker switch allows you to listen to the radio via the built-in speaker while using earphones as an antenna for the FM and NOAA weather bands. The CC Pocket has excellent selectivity (wide/narrow selectable) while providing maximum sensitivity for weak signals. There is a built-in clock alarm function. You get a total of 55 presets (25 AM + 25 FM + 5 WX). And the controls are easy to use. A very compact 2.5" W x 4.25" H x 1" D and only 4 oz. Requires two AA cells (not supplied). For a limited time, a pair of Voz-P ear buds will be included in the package at no additional charge.